Although you may never want to leave the Island, the area also provides a wealth of fun activities from theater to shopping from amusement rides to horseback rides from festivals to musical events. 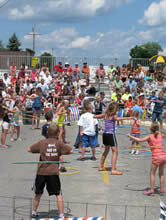 Home of the world’s largest Tiger Muskie, Nevis hosts Muskie Days, as well as the wildly popular Pig Races, every July. You’ll also find casual eateries, groceries, a liquor store, laundromat, gas, propane, bait, fishing supplies, a mini golf course, coffee shop, gift shops and bike rentals. The Restaurant Capital of the World and the busiest little town around, Dorset draws in visitors with its bevy of restaurants, shops and tongue-in-cheek boosterism. Celebrate summer at the Taste of Dorset in August, grab a hand-dipped ice cream cone at the General Store or find a treasure from one of the many shops. Need Internet access? Dorset is a Wi-Fi hotspot, so just ask a server or clerk for the access code. Each year, Dorset chooses the town's mayor by drawing a name from a hat. At the 2016 Taste of Dorset, Gwendolyn Davis of Utah won the mayorship in this rather unconventional election. Just 11 miles away, Park Rapids is the quintessential northwoods town. It’s bustling downtown boasts shops, a movie theater, restaurants, supermarkets, services such as a laundromat, boat and motor repair, hardware store and more. On the shores of stunning Leech Lake, Walker is a true Up North resort town filled with restaurants, shops and the newly restored Chase on the Lake resort hotel with its great lakeview dining room and deck. Stroll down Main Street, take a tour of the lake, try your luck at Northern Lights Casino or catch the Moondance Jam classic rock festival in July. A little farther afield is Detroit Lakes with its shops, restaurants, golf courses and the nationally recognized WE Fest the first weekend of August. This 27-mile paved bike trail extends from Cass Lake through Walker to Park Rapids, passing through Nevis and Dorset. Bring your own bike or rent one in any of the trail’s towns. Minnesota’s first – and loveliest – state park is just 30 minutes from Campers’ Paradise. Bike, hike, swim, fish, explore the history of early northwoods settlers and native people. Take a cruise on Lake Itasca or enjoy lunch at historic Douglas Lodge. No trip to Itasca would be complete without crossing the stepping-stone path at the Headwaters of the mighty Mississippi River, which begins its journey to the Gulf of Mexico at Lake Itasca. Take a two-hour, naturalist-narrated tour aboard the 141-passenger Chester Charles II on beautiful Lake Itasca, the source of the Mississippi. Tours are offered daily. Visit the web site for details and schedules. Learn about Minnesota’s logging history and treat yourself to a real lumberjack breakfast at the Rapid River Logging Camp. Just north of Park Rapids on U.S. Hwy. 71 you'll find Evergreen Gifts and Fun Park, a fun-for-all-ages amusement park with mini golf, bumper boats, go carts, batting cages, super bounce, climbing wall, maze, a kiddie train, snack bar and a delightful gift shop. Once an operating farm, the buildings on the picturesque site have been converted to differnt boutiques featuring clothes, home decor, kitchen wares and specialty food items, garden decor and much more. Savor a leisurely lunch or a hand-dipped ice cream cone or slice of pie in the charming Sun Porch dining room. Summerhill Farm is north of Park Rapids on U.S. Hwy 71. Check out the links in the Campers’ Paradise area including Bear’s Den, Blueberry Pines, Eagle View, Fair Havens, Headwaters Golf Club, and Tianna Country Club. Explore the northwoods on horseback. Several stables in the area offer trail rides through the areas prairies and pines.